These are the SF Green Party Endorsements for the November 2018 election. 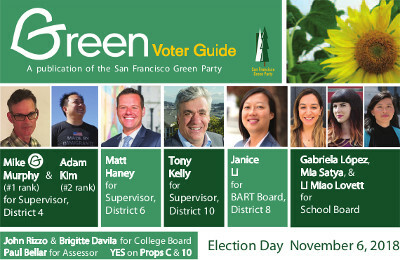 Our complete Green Voter Guide is now posted. Click "read more" to see full explanations of the reasons behind our endorsements. D8 Supe: no candidate sought our endorsement this time, although we just endorsed Rafael Mandelman in June. Click below to read our complete Green Voter Guide. 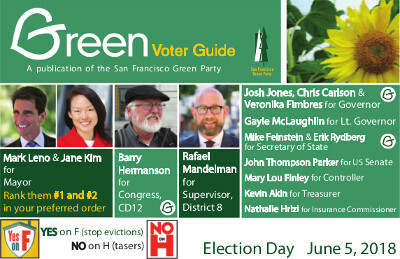 These are the SF Green Party Endorsements for the June 2018 election. Update, May 14: All Greens involved in making our original endorsements have reached unanimous consensus to withdraw our endorsement of Angela Alioto, after she filed a ballot initiative that would result in undocumented immigrants who are arrested under suspicion of committing a felony to be turned over to ICE, without giving the person a chance to contest the accusation. This act is contrary to Alioto's stated positions in response to our candidate questionnaire, and we cannot support any candidate who denies an accused person's right to due process. All candidates we endorsed for Mayor and D8 Supe answered our election questionnaires. You can read their answers here. Mayor: We have dual-endorsed (without ranking) two candidates: Mark Leno and Jane Kim. We encourage all voters to rank both of these candidates in your preferred order, in order to end more than two decades of rule by the Willie Brown machine. Governor: We have endorsed multiple Greens running for Governor: Josh Jones, Chris Carlson, and Veronika Fimbres (write-in). YES on F: Right to an attorney for tenants facing evictions. YES on G: Parcel tax to give SF teachers a pay raise. NO on H: Tasers for SFPD. NO on I: Advisory measure about the Warriors that will have no effect other than to decrease voters' support for the ballot initiative process. YES on 68: $4 billion bond that mostly goes to state parks and wildlife (with our usual bond reservations). YES on 69: Restrict vehicle fees to be used for transportation, with more money for transit (although we would like even more of this money to go to transit). NO on 70: Raid on "Cap & Trade" fund (although we want real effort to fight climate change, not Cap & Trade). YES on 71: Allows statewide ballot measures to have time delays. YES on 72: Tax breaks for rainwater capture systems. The SF Green Party will host a candidate forum on Wednesday, March 14, from 6-9 pm--come ask questions to candidates in local races. Our forum and endorsement meeting will take place in the theater on the 2nd floor of the Redstone Building, located at 2940 16th Street (between Mission and South Van Ness, 1 block from 16th St BART). The event is open to the public and all are invited! Mayor: Angela Alioto, London Breed, Jane Kim, Mark Leno, Amy Farah Weiss, Ellen Lee Zhou. Michelle Bravo, Richie Greenberg, and write-in candidates did not respond to our questionnaire. Supervisorial candidates (D8): Rafael Mandelman. Jeff Sheehy did not respond to our questionnaire. Another candidate did not provide contact information to the Department of Elections. How Green is Your Supervisor? This is our report card for the SF Board of Supervisors in 2017. It shows the most important votes in 2017, from a Green Party perspective, and whether each supervisor supported or opposed our position. Some of the votes are on amendments to legislation. Compare to our 2016, 2015, 2014, 2013, and 2012 report cards. 2017 was a "go along to get along" year, with few votes breaking down along traditional "progressive" vs "conservative" lines. With conservatives firmly in control of the City, really bad legislation was passed with near unanimity, while potentially good legislation was watered down to the point of ineffectiveness. The lack of progressive leadership at the Board is reflected in the worst scores we've given in years. Note that some votes in early January that we thought were very important, such as Free City College and the Alex Nieto Memorial, were repeat votes on issues that we already scored in 2016, so we didn't score them again this year. The San Francisco Green Party opposes the proposed demolition of existing homes at Midtown Park. In addition, the San Francisco Green Party supports Midtown residents’ decision to ask for the removal of Mercy Housing as the City’s leaseholder of the property. In 2007, the San Francisco Board of Supervisors resolved the following guiding principles to afford Midtown residents the opportunity for housing sovereignty: 1) prevent displacement, 2) involve tenants, 3) protect long-term affordability, 4) explore alternative ownership structures, and 5) ensure safe, sanitary, and decent housing. The proposed demolition does not honor this resolution which was passed unanimously by the Board of Supervisors and signed by former Mayor Gavin Newsom. The proposed demolition, in fact, will result in the violation of all of the above guiding principles. Midtown residents have detailed a problematic relationship with Mercy Housing and as such are aggrieved. Mercy Housing has received these grievances from residents and residents have stated that Mercy Housing has not acted in good faith to address them. These grievances include the following: 1) Reduction of security staff, 2) Creating adverse conditions for seniors—prohibitions from moving to ground-floor apartments, 3) Entering apartments without notice and permission, 4) Unresponsiveness of Mercy on-site manager, 5) Increases in fees for Parking allotment/tow threats, 6) withholding vacant units from seniors and family members on wait-list, 7) “Change of tenancy” threats which would result in rent increases, 8) Deferred maintenance—broken fixtures, mold, improper disposal of renovation debris, 9) failure to keep adequate records, 10) failure to abate nuisance from pests, 11) misuse of property—tenancy by Mercy Housing staff, and 12) harassment—after hours notification/communication. Midtown was built in response to the razing of the Fillmore—Western Addition in the last Redevelopment era. Residents whose homes were taken by the City using eminent domain were given few relocation options. Midtown Park was one. The last vestiges of the community that was forcibly relocated by Redevelopment remain at Midtown. That community was given assurance that they could buy in and secure their homes for the future. Others have joined them in their endeavor to build and maintain a healthy and vibrant community and work to develop their full potential as such. Demolition of homes to create “affordable housing” will directly and indirectly displace residents at Midtown. Mercy Housing has proven to be unwilling to address residents’ current concerns while entering into a profitable future agreement with the City. The City and Mercy Housing should not be in the broken social contract business. The San Francisco Green Party supports the residents of Midtown in their endeavor to keep their homes and to continue to work to maintain and enhance their sense of community and quality of life.